The British founders of Team Kilimanjaro climbed in several mountain ranges throughout the world before deciding to concentrate their principal efforts on Kilimanjaro. There are many good reasons for their choice that will be obvious to anyone apprised of any Mount Kilimanjaro facts or who has been privileged enough to spend time in the Kilimanjaro region. Kilimanjaro, Africa’s highest mountain, has been summitted by a 5 year old, an 87 year old, several quadriplegics and amputees, and has been climbed from the park boundary to the summit in under 5 hours! Surprisingly, many people still believe that Mount Kilimanjaro is located in Kenya. While it is possible that this belief has come about because many Kenya guide books or promotional posters show what is perhaps the best long distance view of Kilimanjaro taken from within the relatively nearby Amboseli National Park in Kenya, on the northern side of Kilimanjaro, nonetheless the entire park boundary that demarcates the mountain’s official edges does indeed lie within Tanzania. So, Kilimanjaro is definitely in Tanzania, not Kenya! All this being said, when using a modern GPS that approximates the geoid globally, you can likely expect your GPS to tell you that the elevation of Kilimanjaro is 5895 metres. We tested this assertion very thoroughly when assisting a Swiss team of map makers to produce what we believe is still the best available topographical map of Kilimanjaro (in spite of a handful of very minor errors) to survey the mountain in 2005. As you can see from the slideshow below a GPS on WGS84 was observed carefully over a period of 17 minutes and fluctuated only between 5894 and 5895 metres. This is a hotly contested question. The simple answer is that we recommend that if you want to enjoy your climb and haven’t recently been above 4,000 metres within the last fortnight, and want to summit, you should allow yourself 7 days for the ascent and descent. The Royal Geographic Society – of which our founder is a Fellow, and with which on this point he disagrees vehemently – states that it is not safe to obtain more than 300 vertical metres of elevation in any 24 hour period, and that at each successive vertical kilometre one should rest for an additional 24 hours. By this advice one should not attempt to ascend Kilimanjaro within fewer than 10 days. Conversely, John Rees-Evans argues that prolonged exposure to high altitude has a deleterious effect and that there is therefore an optimum amount of time one should spend climbing Kilimanjaro that lies halfway between the minimum time within which one can gain adequate acclimatization to ensure safe summit access, and the minimum time after which evidence of enduring physiological malfunction is suffered. In Rees-Evans’ experience of overseeing in excess of 15,000 people in reaching Kilimanjaro’s summit, John argues that 5 and half days for the ascent is optimal. To demonstrate the body’s ability to cope for very short periods at high altitude prior to obtaining acclimatization, John Rees-Evans has summitted Kilimanjaro from the park gate in 10 hours 25 minutes unacclimatized, and his wife, Rebecca has summitted in 13 hours 16 minutes, also unacclimatized. Their entire family has summitted together in 3 and a half days, including their son Bran who was only 5 years old at the time. However, in the case of the family, they had all climbed Mount Meru the week before and obtained a level of acclimatisation which meant that they were comfortable at 4,000 metres, and in the case of the single day ascents, John and Rebecca had made arrangements for rapid descent in the event that they succumbed to severe AMS during their ascent. While attempted informally from as early as the 1960s by British ex-patriots who lived and worked near to Kilimanjaro, speed climbs on Kilimanjaro have been attempted frequently over the last few years with the feat now having been completed in just 4 hours 56 minutes by Karl Egloff on 13th August 2014. Karl rested 3 minutes on the summit and then ran down to the park gate in 1 hour 42 minutes, making his round trip time 6 hours 42 minutes, some 32 minutes faster than Kilian Jornet. Until 2011, the fastest woman to climb Kilimanjaro was Team Kilimanjaro’s own Rebecca Rees-Evans, who was the very first woman to attempt to run up Kilimanjaro in just one day. She ascended in 13 hours 16 minutes and 37 seconds on 21st May 2005. Her record lasted more than 6 years until Debbie Bachmann, a Kilimanjaro group leader, summitted in 11 hours and 51 minutes. While Rebecca’s time remains the fastest unacclimatised time, there have been many impressive supported speed climbs by women in recent years. The fastest supported, acclimatised time now stands at just 8 hours 32 minutes. Anne-Marie Flammersfeld completed this attempt on 27th July 2015. Interestingly, while Karl Egloff is half Ecuadorian, his father was a Swiss mountain guide. And since Anne-Marie is also Swiss, this now means that both male and female Kilimanjaro speed records are currently held by Swiss nationals, as at May 2016. Kilimanjaro is very competently managed by KINAPA, (Kilimanjaro National Park Authority), whose headquarters is at the Marangu Gate, from where all climbs on the Marangu Route begin and end, and where Rongai Route and TK Rongai climbs are registered and end. KINAPA reports directly to Tanzania National Parks Authority, or TANAPA, whose offices are in Arusha, and mainly comprises administrators and conservationists. While there are no mountaineers employed by KINAPA, they nonetheless frequently work with externally subcontracted East African mountaineers such as Willy Shikuku in Kenya, or with foreign climbers, such as our director, when it is necessary to be able to consult on matters of mountain safety or to obtain expert perspectives on route selection. The access to both wildlife and mountaineering expertise that the park authorities enjoy mean that Kilimanjaro National Park is bearing up reasonably well against the threats against its sustainability, as well as managing the ongoing challenge of facilitating the safe movement of climbers along six trails and their many variants, and up three assault routes. In spite of their very obvious successes – particularly with their excellent trail maintenance on the busiest routes and their new generation of mountain toilets that are able to be emptied of waste (rather than the waste remaining in the ground as per the old model), there are however some continued causes for concern which we believe still need to be addressed. 1. With some 20,000 – 35,000 climbers attempting to climb Kilimanjaro annually, we believe that there should be two further assault routes available, in addition to Barafu, Kibo and the Western Breach. We believe that assaults should be permitted from Credner Glacier and Pofu Ridge. Allowing assaults from the north would ensure that Kilimanjaro appealed to a wider segment of climbers, including those who seek to have a technical component in their high-altitude challenge, since the Credner assault requires that the Northern Icefields be traversed, and that climbers should be competent in the use of crampons, ropes and ice-axe. Opening these two assault routes would reduce summit crowds and spread the environmental impact caused by congestion, more evenly across the mountain, thereby representing less of a threat to Kilimanjaro’s fragile ecology. Details of the Credner assault can be seen towards the end of our Kilimanjaro Ecological Route Proposal. While we are generally speaking ideologically strongly opposed to measures that seek to interfere with the traditional ways of life of indigenous people, (which is why we are unable to support the otherwise nigh-unanimously praised campaign, 1Goal: Education for All, which seeks to ask the Tanzanian government to try yet again to force the Hadzabe to ask their children to reject their traditional hunter-gatherer way of life in favour of adopting what some westerners believe to be a better way of life), we nonetheless believe that the routine deforestation perpetrated by local women on the slopes of Kilimanjaro, should be arrested. The local women are very poor and do not have the means to obtain fuel for cooking, so they surreptitiously enter the forests and cut wood. Regrettably, the wood that is cut is not replaced, and – as is evident from aerial imagery – Kilimanjaro’s forests are shrinking. 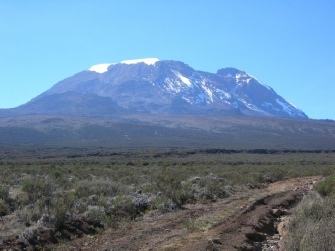 The denuding of Kilimanjaro’s vegetation prevents moisture being retained and reduces precipitation, meaning that at high elevations there is less snowfall and re-glaciation. As the glaciers disappear, the rivers shrink, and the civilization below that relies on these rivers to sustain their villages and water their cattle, suffers greatly. The extent of this suffering is very pronounced on the north side of the mountain where it is nowadays nigh impossible for Maasai to maintain their herds. We believe that a fund should be made available that would provide cooking fuel to the local women and that patrols should be conducted to ensure that no more deforestation occurs. In spite of our working closely with Tanzania National Parks in 2006 to develop a new route along which it would be possible to organise research expeditions that could quantitatively monitor de-glaciation as a result of global climate change and illegal local forest depletion, our new route remains unopened. Details of the route are available here. Those who care for the ecology of Kilimanjaro are invited to approach Tanzania National Parks independently and make similar such recommendations. High volumes of expressed concern will have a significant impact of the organisation’s policy-making over the next few years. While we continue to use Crater Camp for our Excel Series climbs, we believe that it should be temporarily shifted several hundred metres from its present location, while a clean up operation is conducted. The operation should include the installation of several toilets that have reservoirs that allow the accumulated waste to be removed and carried down the mountain, as climb operations are evidently supplying adequate facilities for their staff at this location, and the present requirements are impossible to enforce since the camp is not manned by any KINAPA personnel. We also believe that a new minimal environmental impact hut should be erected close to the present camp site. The hut should have a small dormitory for some 4 additional users and be staffed by rangers that have received enhanced high altitude medical training. TANAPA should invite doctors and physiologists with a special interest in high altitude research to regularly occupy the hut while the rangers conduct their duties. The hut should be equipped with several modern lightweight stretchers and contain oxygen canisters for use in medical emergencies. Kilimanjaro is a volcano situated at the southern extremity of the northern Great Rift Valley. The mountain comprises three volcanic outcrops; from the west, Shira, Kibo, and Mawenzi. While Mawenzi is some 750 metres lower than Kibo, it is conjectured that she was once higher but has since collapsed. Congratulations! You are now at Uhuru Peak, Tanzania, 5895 metres above mean sea level; Africa’s highest point; world’s highest free-standing mountain; one of world’s largest volcanoes. Welcome! According to some local people, Kilimanjaro is often believed to have been climbed some thousands of years. While hardly qualifying as one of our ‘Mount Kilimanjaro facts’, some people in Marangu believe that Kilimanjaro was first climbed by a son supposedly produced by King Solomon and the Queen of Sheba. However, the first people recorded to have climbed Kilimanjaro were Hans Meyer, Ludwig Putscheller, and Yohani Lauwo, the great grandfather of Abel Lauwo. Abel still climbs Kilimanjaro to this day and it is possible that some of our readers may be accompanied by him on their climb! There are ten commonly used spellings for Kilimanjaro, and only one is correct! Each month, however, it appears that some nine thousand people spell Kilimanjaro incorrectly. We hope you’ll be as fascinated as we are to see which wrong spellings are the most frequently used. When is the best time to climb Kili?